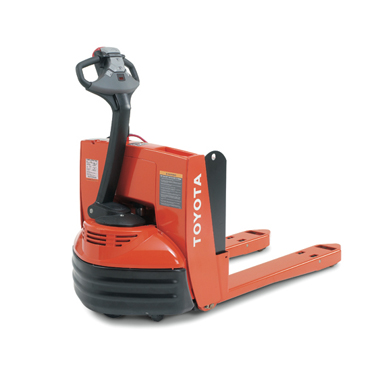 Toyota's Electric Pallet Jack is highly maneuverable and reliable to increase productivity. It offers an innovative, compact design that improves space utilization in confined and congested applications. Separately Excited (SepEx®) Drive Motor offers excellent acceleration and top travel speed loaded or unloaded. SepEx® Transistor Control System with MOSFET delivers smooth speed control for precise positioning of the truck. "Pinwheel" Capability is facilitated by placing the control handle in a near vertical position to allow for right angle stacking inside trailers or other confined areas. Tapered Fork Tips combined with a reduced head length offer a compact design for maximum maneuverability. Low Speed Torque provides increased power to climb dock plates, tailgates, and floor joints without lurching or stalling. Electric Lift and Lower Controls on the handle are equipped with a pressure-compensated valve for constant lowering in all conditions.. Performance Parameters for up to ten individuals may be customized through the digital display to meet a wide range of job applications and operator skill levels. Auto-Off System is programmable to conserve battery power. One-Piece Lift-Off Service Access Cover provides easy access to all major components for inspection and maintenance to reduce service time. No Drive Contactors reduce routine maintenance and inspection time. Electrical, Hydraulic and Mechanical Components are logically separated for reduced maintenance problems and easy service. Programmable Service Indicator notifies operators of routine maintenance and service needs through the display. Self-Diagnostics provided through the digital display allow easy trouble-shooting without the use of an external hand-held analyzer. Polyethylene Stability Wear Pads are reversible for extended service life. 24 Volt Electrical System delivers efficient power for maximum performance and longer work cycles. Controller Area Network (CAN-Bus) Communication Technology provides quicker, more reliable control of all truck functions with fewer components. One-Piece Transmission and Motor Drive Unit provides better heat transfer for long, trouble-free lift. Wrap-Around Steel Bumper protects the drive unit and drive tire against damage. Lift Cylinder is Chrome Plated for enhanced wear resistance for various environmental conditions.